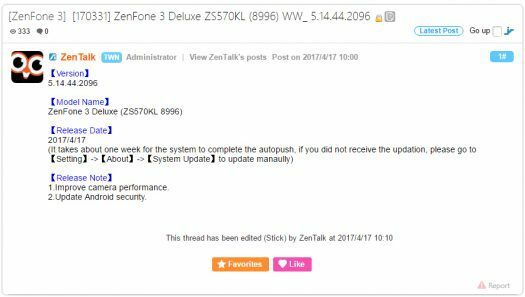 Good news for Zenfone 3 Deluxe (ZS570KL) owners. Asus now has a new software update which sounds promising. According to release notes this update will improve camera performance and also provides an android security update. Because I’m currently using a ZS570KL I will update my review if there are noticeable improvements to the camera performance. Without know the details, it’s going to be a bit of a guessing game for now.